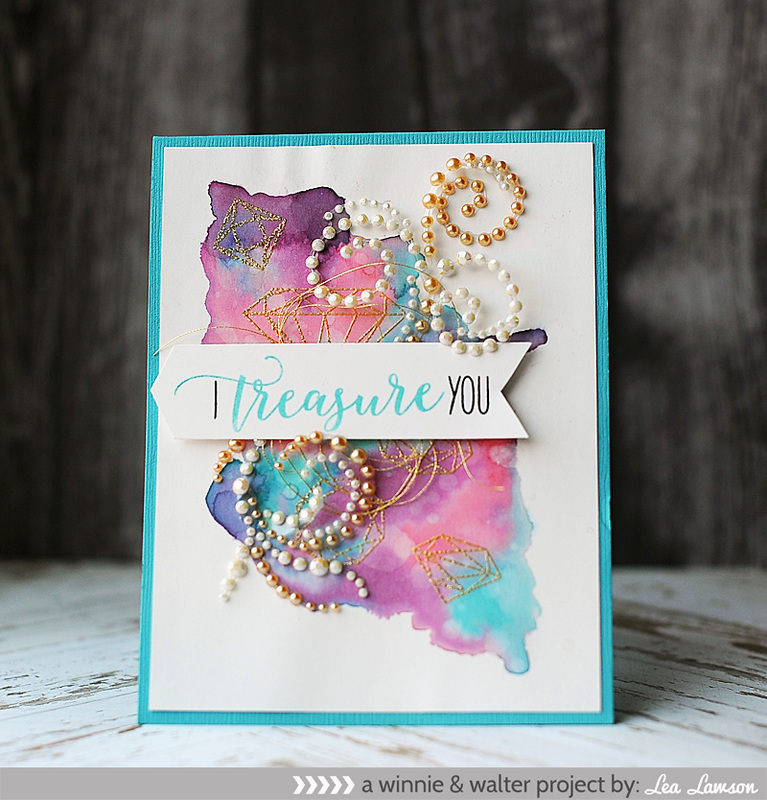 Today we are sharing more new stamps & a Cutaway that have a bling & sparkle theme! You can see a full reveal of all items, plus enter for your chance to win them on today's Winnie & Walter blog post. 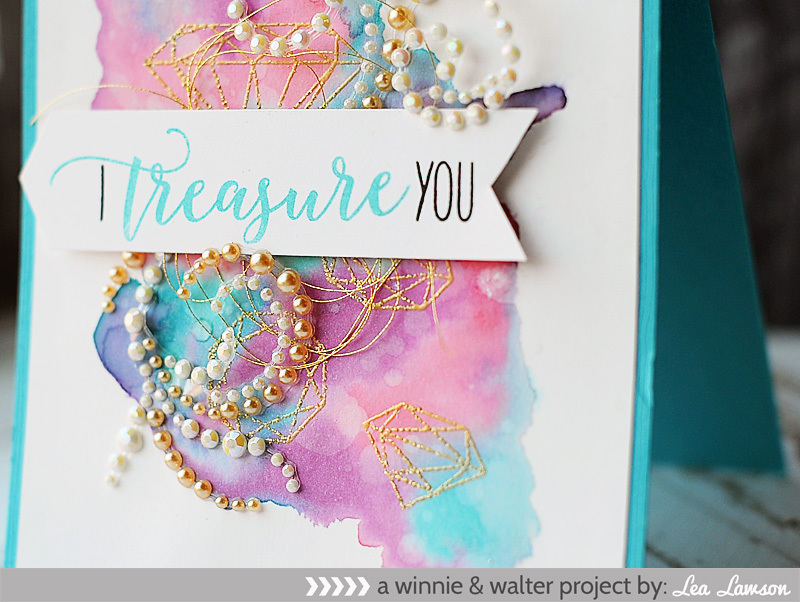 For my first card I've focused on some of the stamp sets with bling & gemstones...the sentiment fonts are just beautiful! I watercolored the background with Tim Holtz distress inks. I kept the colors bold, and created more of a tie-dye feel to it. Once it was dry, I flicked droplets of water on to it. When you soak them back up with a paper towel it will take some of the ink with it, creating a nice bokeh effect. After that I stamped & embossed the gems in gold. I stamped the sentiment a strip of white cardstock, then cut arrow shaped ends to it. I layered it to the front with a knot of gold thread, then accented with the flourishes to finish. For my next card I used the new Mini Scenery stamp set, and did yet another rainbow colored card. I stamped & heat embossed the faceted scenery to a block of white art paper. Then I watercolored it in a rainbow gradient. Once dry I mounted it to a black cardbase. Then I diecut the word hello from patterned paper, and the tag from black cardstock. 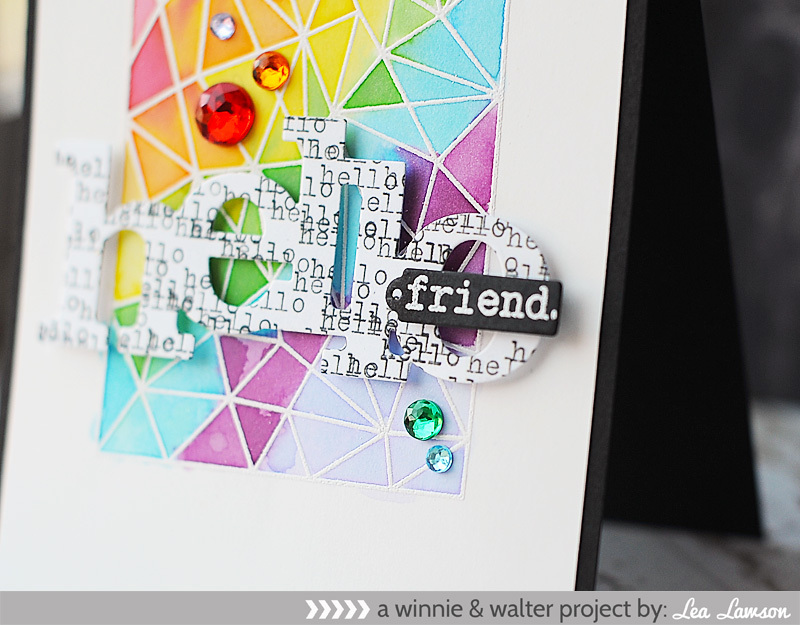 I stamped & heat embossed the word friend to the black tag, then layered both cuts to the card front. I accented it with some jewels to finish. Tonight is the night!!! 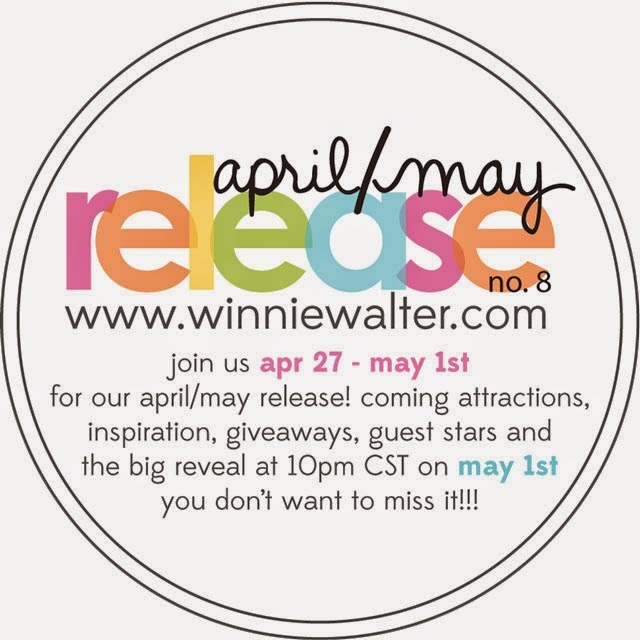 All of our new stamps & dies will be available for purchase tonight in the Winnie & Walter store...so start making your wishlist, and be ready to go add those goodies into your cart!! Ooooooo! Inky and sparkly and filled with all sorts of good gems. These are gorgeous! LOVE. The first card is amazing with all of the goodies and your second card is fabulous! Very NICE, Lea. Very nice indeed! These are just fantastic! I especially love the first one, it give me an ocean treasure vibe. Oh wauw, those colors on the first watercolored card are really beautiful! And all the details on top of it... also! These are FAB! Love the treasure card, absolutely WONDERFUL! Какая красота!!!! Очень динамично и ярко! I am so in love with your second card Lea! Just WOW! What a wicked cool card! I love the embellies you added! Cool beans!